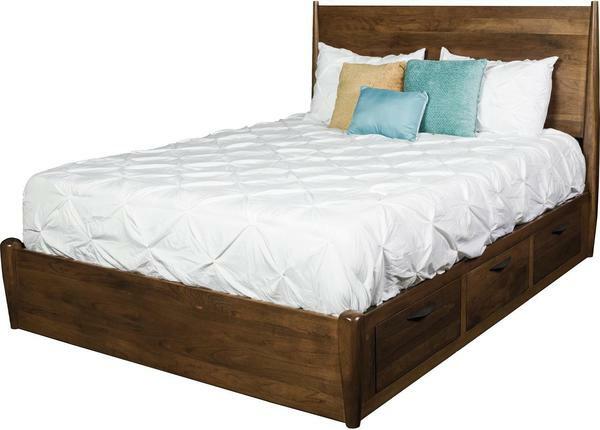 Available in a full, queen, or king size, the Amish Kenton Panel Storage Bed can be incorporated into any bedroom and instantly become the centerpiece! Keep all of your blankets, pillows, bedding, extra clothing and other items stored away in the under bed drawers. There are three drawers on each side of this storage bed providing ample storage space in your bedroom. Choose a full, queen, or king size for your new Amish bed to be crafted in. Once your bed size is selected, you will get to choose your favorite hardwood and finish color. Choose a combination that matches with the rest of your bedroom suite! If you would like assistance with this, please call one of our Amish Furniture Specialists at 866-272-6773.